National Book Award-winner Polly Horvath’s latest, a rabbity romp complete with whimsical illustrations and a quirky cast of characters, has both the look and feel of a classic children’s book, raves The Washington Post. In this hilarious chapter book mystery, meet a girl whose parents have been kidnapped by disreputable foxes, and a pair of detectives that also happen to be bunnies! When Madeline gets home from school one afternoon to discover that her parents have gone missing, she sets off to find them. So begins a once-in-a-lifetime adventure involving a cast of unforgettable characters. 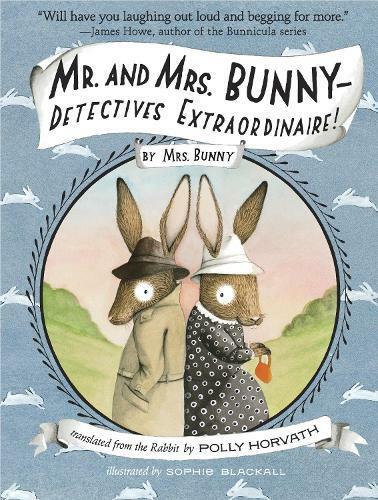 There’s Mr. and Mrs. Bunny, who drive a smart car, wear fedoras, and hate marmots; the Marmot, who loves garlic bread and is a brilliant translator; and many others. Translated from the Rabbit by Newbery Honor-winning author Polly Horvath, and beautifully illustrated by Sophie Blackall, here is a book that kids will both laugh over and love.